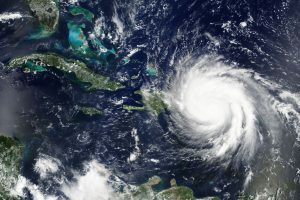 Hurricane Maria was 2017’s 13th named storm system in the Atlantic Ocean and made landfall on Puerto Rico on September 20th having already devastated many islands in the Caribbean. Maria proved to be one of the worst natural disasters in recorded history, destroying the island’s power grid, water supply, homes, and roads. A study released by the New England Journal of Medicine estimates Hurricane Maria resulted in 4,645 deaths. Allan Cintron Salichs, Executive Director of MedCentro Consejo de Salud Puerto Rico, Inc., says emergency preparedness is standard procedure and when a hurricane is announced the entire staff meets to go over preparations. His health center even makes it a point to prepare emotionally to manage stress. Realizing communications would probably be affected by Hurricane Maria, MedCentro planned for their staff to meet in one location at 7 a.m. the morning following the hurricane. It was difficult for some to travel as roads were jammed with trees, poles, and cables. The meeting provided an opportunity to assess capacity during a worst case scenario. At that meeting they were able to identify who could make it to the health center, who was missing, and how everyone was doing emotionally. The latter involved observing senior leaders to make sure they could carry on their duties. MedCentro assessed their staff’s needs and supported them in multiple ways, including by providing transportation from their home to the site and providing staff with water when water was scarce. MedCentro also sought to relieve the financial stress that is often brought on by these situations. Staff were paid during this period and the organization was flexible and reasonable about time off. According to Cintron, the health center also has a contingency fund for extraordinary situations. Because of Maria, the health center’s board increased the fund and every MedCentro employee was given an additional $2,000 to cope with financial losses. Extra funds were also allocated for the employees who suffered significant losses. In total the needs of 41 employees were found to be significant. The leadership at MedCentro worked hard to make sure work caused as little stress as possible for staff and that the environment provided a sense of normalcy from the chaos outside the health center. Some of the efforts to reduce stress came in the form of letting staff know they were important and making them feel secure in their work even prior to Hurricane Maria. But even following Maria, the health center’s housing department and behavioral health department opened its doors. He says MedCentro’s leadership was very well prepared but he doesn’t think it was enough. He believes emergency preparedness needs to include emotional preparedness for all employees so they are prepared to deal with the chaos they will encounter after a situation like Hurricane Maria.